As you all know, I'm fond of financial scorecards. While admitting their limitations, I like numbers and tools that allow you to compare your financial progress with other people. Perhaps my favorite number is net worth, the total value of everything you own. Calculating net worth is easy. It's what you own minus what you owe. That's it. Simple, right? Simple but powerful. Want to calculate your own net worth? 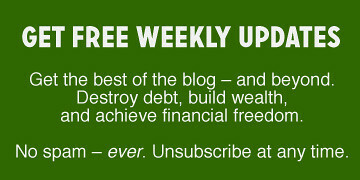 I've created this free net worth spreadsheet in Google Docs for you to download or copy. It's still branded with Money Boss, but I'll change that soon. Net worth is a great way to track your own financial progress as you age. But have you ever wished you could compare your net worth with the net worth of other Americans? I have. It's possible, but it's a complicated process that required digging through tables of government data. 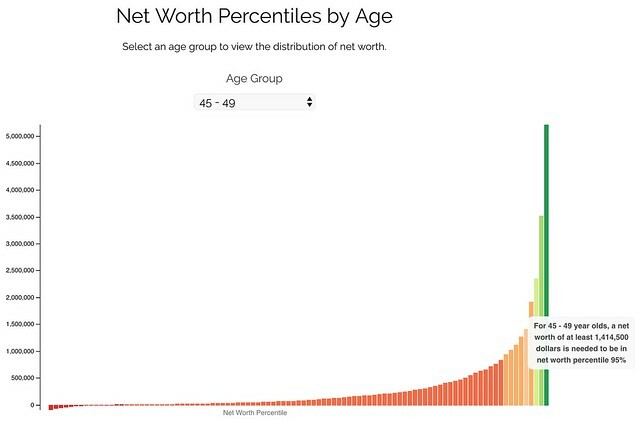 Well, Zach at Four Pillar Freedom — who must have too much free time — recently took info from the Federal Reserve's 2016 Survey of Consumer Finances and created a couple of tools that let you visualize the net worth of Americans by age. These tools aren't sophisticated. They perform simple tasks, but they perform them well. Here, for instance, is Zach's tool for looking at net worth percentiles by age. If you too are a money nerd who likes to compare yourself to others, then take a few minutes to explore Zach's net worth visualizer! There are 19 reader responses to "Visualizing your net worth — and how it compares to others". Neat tool. It’s nice to break it down by age. Us younger folks are at a big disadvantage as compared to retirees when it comes to net worth. I love calculators that make me look good!!! Very cool. I’ll check it out now. Is that net worth per person, or per household? How do you access the worth if it is held in joint funds for the most part (besides 401k sort of things, which, then, do have a beneficiary and if, God forbid, the union comes to an end, will be split as well). In general, net worth is usually calculated per household, I think. In my case, I’ve always calculated personal net worth. That’s because Kris and I had completely separate finances when we were married, and now Kim and I have separate finances. The Survey of Consumer Finances — which Zach used for his data — tracks household net worth. Thanks. I got the “what net worth is”, and the liquid vs total. That is not a problem. Iwas just curious, always, when read articles, the “per person” vs “household”. As a general rule, not when the couple is not legally married sort of thing. I often joke: “Is he is a millionaire, she is not, or they both ‘almost’ millionaires each but not quite, or they are but together?”. I don’t include home in my net worth. For two reasons. First, the value is based on what your home can be sold for. That is very difficult to pin down. I know, I can’t get rid of the house we have on the market. So we moved across country and now have two mortgages. (ugh). Second, for those people that plan on staying in their home, I think it is wrong to include it as an asset like they were planning on selling it. (Although I guess, as you mention, you could get a reverse mortgage). Really, for me it’s the first one. We just can’t get rid of that house, and it’s frustrating. (Even after offering it for a huge loss). Houses aren’t investments. They are speculation. Once I’m down to one house, I may include the equity, but not 100%, probably only 80%ish. That way if I do sell, I’ll be more willing to sell, instead of being stuck on a higher price. I feel you on not including my home value in my net worth. Mainly because I plan on keeping my current house indefinitely. Not to say I’ll live there the entire time, as I am currently renting it out with the intent of returning someday. Future rental properties yes I would count. But my feeling is I have to live somewhere, so if I do sell a house in order to purchase another one to live in, it’ll end up being a wash most likely. Count me as one vote for including the primary house in net worth -only the equity, of course. You can figure out the approximate value of the house on sites like Redfin. A: A lives in San Francisco. A was renting, but then A inherited a house, so naturally he moves in and stops spending 6000K per month on his rent, as is the norm in San Francisco. The house is worth a million dollars, and it’s completely paid off because his grandmother bought it in 1954 for 10K. So he has a million in equity. But he owns nothing else. He doesn’t even have a car. B: B lives in Kansas. He rents for $500 per month. He doesn’t own a house, but he’s been diligently saving, and has accumulated $50,000. Who has a higher net worth? The calculators which don’t include your primary residence, would say B is richer. I say that’s absurd. Because A could easily sell his house for a million dollars, buy a mansion in Kansas, and live off the remaining $750,000 for the rest of his life (if he’s frugal about it). A could be financially independent if he chooses. B could not be. We’re closing in on your net worth number. We’re just shy of $1.5 million. It’s so cool to be a millionaire although I doubt anyone would ever guess based on our lifestyle. I still wish I could shout it from the rooftop, though! I think net worth is important but, one should also look at the ability to increase net worth as well. Now you need to use some either conservative estimate or some probabilistic modeling to obtain this. The reason you shouldn’t only look at net worth is take someone out of high school with 0 funds available. If he were to become a fast food worker and add 1k a year to net worth in 7 years he would have 7k net worth. Now, look at someone who took on debt 25k got through their masters and are adding close to 24k a year to save. Now the reason I say you should use a conservative estimate or modeling is that if I take 100k to be a social worker looking at the odds you will have a hard time paying that off. One other factor that isn’t considered is pre-tax vs post-tax. Most 401ks or IRAs are pre-tax, and thus would make someone with similar balances in a post-tax account (like a Roth IRA) look worse off than they really are. You could make the same argument if someone has large unrealized gains in their investment accounts compared to someone who has already realized gains and paid the appropriate taxes. What about pensions? I have used a buyout tool I found online, but the actuarial tables can give wildly different figures. Plus do you believe it requires a risk factor due to how many pensions are liquidated in bankruptcy? I just wanted to add that you should check out the site networthiq – you input your age, occupation, etc and you can compare yourself to everyone on the site. I started in 2012 or so, and for the past few years I update it monthly. It was great to see that after my divorce I was back together pre-divorce net worth in less than 2 years. And last month I hit a big milestone goal for myself. I find the difference between the 40-44 and 45-49 age groups odd, having looked at both since I’ll be “graduating” in a couple of days. My household is in a higher percentile in the older age group, which is counterintuitive to me. I would expect older people to have higher net worth as a general rule. Also, as someone who lives in a volatile housing market, I include our home equity but base it on the most recent assessed value (about five years ago when we refinanced into an absurdly low fixed interest rate loan) rather than an estimate of what we could sell for today. I figure that assessed value is a fulcrum I can rely on, unless the market utterly craters…which is unlikely here. It’s a middle ground I’m comfortable with. I count the house as well. It will be sold one day but more than that, it represents economic value in our economy that gives you options. One reason I like to track NW is because it shows me what assets contribute toward the growth and which ones do not. Though I count the house, I notice it does not grow as fast as my rental properties for example. It demonstrates that I should live frugally and invest in assets that appreciate, wait on the nicer car/truck, etc. It’s a great discipline that I’ve been doing since my NW was about 100k. I still have balance sheets in the form of excel spreadsheets from those days too which is fun to look up on occasion.